Pihu: Starring Myra, Prerna Sharma, voices of Rahul Bagga and Hrishita Bhatt; Directed by Vinod Kapri; Rating: ****(4 stars). If Macaulay Culkin was a little girl who was a far better actor than he, and if Home Alone was a tragic terrifying nervewracking exposition on a 2-year child left all alone in a house filled with electric gadgets and dangerous inclines and a dead parent, this is the film you would get. Let’s be thankful for the new wave in Hindi cinema that has gripped the Bollywood script in 2018 like an obstinate fever. Pihu pushes the envelope so far you can’t see the stamp of any other film on it. On seeing the trailer I had compared Pihu to Chetan Anand’s Aakhri Khat.And to a large extent that parallel remains pertinent. To simply watch a child fending for herself is the most heartbreaking ode to vulnerability on this side of Sadma. 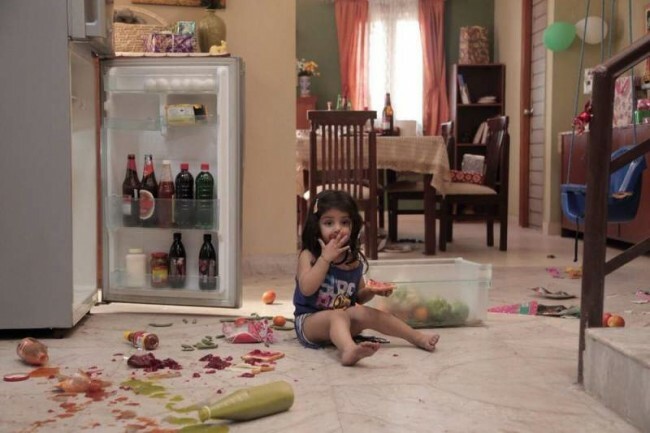 As Pihu prances, giggles, groans and finally weeps her way through the nightmarish emptiness of her well-appointed home, I kept wondering how the director would hold our attention for a full-length feature film with just a 2-year protagonist on screen… Or for that matter, how will he get the 2-year child to go through the motions of an imminent catastrophic crisis? On both counts I am happy to say Pihu scores high points. Not only are we unconditionally riveted to little Pihu’s instinctive survival methods (don’t think Culkin, think Tom Hanks in Castaway) the little wonder-actress is astonishingly clued in to the way the camera works. In no time we surrender to Pihu’s distressful circumstance while she remains oblivious to it. At times her expressions of exasperation at the mess that karma has suddenly dealt her, are so profound I felt I was watching a seasoned actress rather than a child who doesn’t even know what the camera (or karma) is and yet Pihu, for all its disposition to overpower us with a one-character survival saga, is never short of breath. Director Vinod Kapri never runs out of ways to engage our senses in the most heightened state of emotional vulnerability. I can’t begin to imagine how Kapri directed the child. I suspect the child directed herself most of the time, mumbling cajoling coaxing and pleading baby-talk as her mother refuses to answer, breaking into a lisping song (Nani teri morni ko more le gayi will never be the same again), tiptoeing on her little feet to reach for her mother’s cellphone to tell her absentee Papa that Mama is sleeping. Oh, this is the most heartbreaking horror tale of domestic desolation you will ever see. That’s for sure. The jarring notes are provided by extraneous voice. Pihu’s father on the phone sounds like he is participating in a Vividh Bharti play. Noises of a maidservant, watchman and others incidental voices outside the apartment where Pihu is trapped (think Rajkummar Rao with a feeding-bottle in Trapped) sound like they’ve been hired to create sound effects. These apart, Pihu hits all the right notes scaring the hell out of us as the little girl gets into one potentially life-threatening situation after another, all in the ironical ‘safety’ of her own home. Yogesh Jaini’s camera lets little Pihu do as she likes. The camera is a stoic bystander in this tale of a domestic idyll gone horribly wrong. The background score (Abhishek Rey) remains remarkably liberated from over-punctuation, coming on with a frugality that spotlights the vulnerability of the protagonist. If you’ve ever worried about your child’s wellbeing then Pihu will remind you of just how much at risk a child can be put into by selfish parents who forget that once you give birth to a new life your life no longer belongs to you.